↑ ୧.୦ ୧.୧ "Compound Summary". 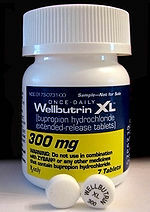 Bupropion. PubChem Compound. United States National Library of Medicine – National Center for Biotechnology Information. 28 July 2018. Retrieved 29 July 2018. ↑ ୨.୦ ୨.୧ ୨.୨ "Zyban 150 mg prolonged release film-coated tablets – Summary of Product Characteristics (SPC)". electronic Medicines Compendium. GlaxoSmithKline UK. 1 August 2013. Retrieved 22 October 2013. ↑ ୩.୦ ୩.୧ "Prexaton Bupropion hydrochloride PRODUCT INFORMATION". TGA eBusiness Services. Ascent Pharma Pty Ltd. 2 October 2012. Retrieved 22 October 2013. ↑ Zhu, A. Z. X.; Zhou, Q.; Cox, L. S.; Ahluwalia, J. S.; Benowitz, N. L.; Tyndale, R. F. (3 September 2014). "Gene Variants in CYP2C19 Are Associated with Altered In Vivo Bupropion Pharmacokinetics but Not Bupropion-Assisted Smoking Cessation Outcomes". Drug Metabolism and Disposition. 42 (11): 1971–1977. doi:10.1124/dmd.114.060285. PMC 4201132. PMID 25187485. ↑ ୮.୦ ୮.୧ ୮.୨ ୮.୩ ୮.୪ ୮.୫ ୮.୬ "Bupropion Hydrochloride Monograph for Professionals". Drugs.com. American Society of Health-System Pharmacists. 5 February 2018. Retrieved 15 July 2018. ↑ Schwasinger-Schmidt, TE; Macaluso, M (8 September 2018). "Other Antidepressants". Handbook of Experimental Pharmacology. doi:10.1007/164_2018_167. PMID 30194544. ↑ ୧୦.୦ ୧୦.୧ ୧୦.୨ Fava M, Rush AJ, Thase ME, et al. (2005). "15 years of clinical experience with bupropion HCl: from bupropion to bupropion SR to bupropion XL". Prim Care Companion J Clin Psychiatry. 7 (3): 106–13. doi:10.4088/pcc.v07n0305. PMC 1163271. PMID 16027765. ↑ "Bupropion Use During Pregnancy". Drugs.com (in ଇଂରାଜୀ). Retrieved 24 December 2018. ↑ ୧୨.୦ ୧୨.୧ Dwoskin, Linda P. (29 January 2014). 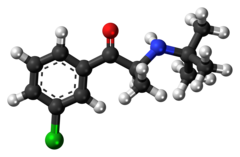 Emerging Targets & Therapeutics in the Treatment of Psychostimulant Abuse. Elsevier Science. pp. 177–216. ISBN 978-0-12-420177-4. ↑ Tasman, Allan, Kay, Jerald, Lieberman, Jeffrey A., First, Michael B., Maj, Mario (11 October 2011). Psychiatry. John Wiley & Sons. ISBN 978-1-119-96540-4. ↑ Sweetman, Sean (2011). Martindale: The Complete Drug Reference (37th ed.). p. 402. ISBN 9780853699828. ↑ Dye, Leslie R.; Murphy, Christine; Calello, Diane P.; Levine, Michael D.; Skolnik, Aaron (2017). Case Studies in Medical Toxicology: From the American College of Medical Toxicology (in ଇଂରାଜୀ). Springer. p. 85. ISBN 9783319564494. ↑ Mehta NB (25 June 1974). "United States Patent 3,819,706: Meta-chloro substituted α-butylamino-propiophenones". USPTO. Retrieved 2 June 2008. ↑ World Health Organization (2000). "International Nonproprietary Names for Pharmaceutical Substances (INN). Proposed INN: List 83" (PDF). WHO Drug Information. 14 (2). Archived from the original (PDF) on 1 February 2010. Retrieved 22 June 2009.